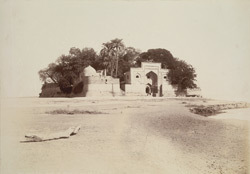 Photograph of the Shrine of Zind Pir at Sukkur in the Shikarpur District of Sindh in Pakistan, taken by Henry Cousens in 1896-7. This view looks across the causeway towards the entrance to the tomb. Cousens wrote in the Progress Report of the Archaeological Survey of Western India, 1897, "Upon the upper side of Bukkur, and joined to it at low water, is the compact little island upon which, under the cool shade of some large trees, is the famous shrine of Zinda or 'Jind' Pir. The island has been raised and protected against the corrosion of the river by retaining walls of strong rubble masonry all around. The great gateway facing Rohri is a far more imposing structure than the mean little domed shrine itself. The latter occupies the centre of the island, and is a remarkable plain small square building surmounted by a low dome..."